The Smallest Fox Species In The World Is The? What Is The Only Other Body In Our Solar System With Surface Liquid? Found throughout the Sahara Desert in North Africa, the fennec fox is quite notable for a variety of reasons including first and foremost, if you’ll excuse the editorializing, being the most adorable fox in the entire Vulpes genus. Putting aside the subjectivity of adorableness, however, there are some rather notable scientific facts about the bat-eared little fox. First and foremost, the fennec fox is, at a maximum weight of around 3.5 pounds, the smallest fox (and canid) in the world. By contrast, the common red fox, found throughout the world, can weigh up to around 31 pounds. Further, the fennec fox is incredibly well adapted to life in the desert. 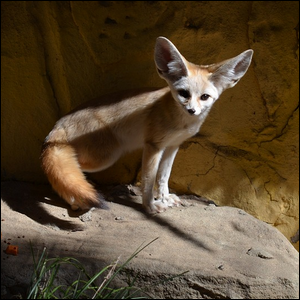 Its enormous ears, for example, not only help keep it cool (they act as giant radiators, much like elephants’ ears do), but also allow the fennec fox to detect tiny prey tunneling beneath the desert sands. When not hunting small prey like insects, rodents, birds, and rabbits, the fennec fox spends much of its time avoiding the scorching desert sun in its elaborate den. For a creature scarcely bigger than the smallest of house cats, the fennec fox lives in a den that can be as large as ~1,300 square feet and may have up to 15 different entrances—some dens even interconnect with the dens of other fennec families, creating palatial hidden compounds.